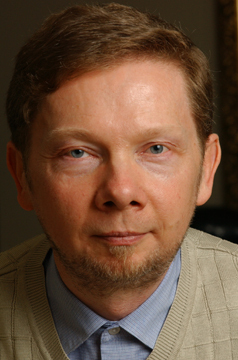 I have realized, just as Eckhart Tolle has done. That universal love does not come from the outside five senses. But manifest from the within. You may call it heaven and when we love all beings. We create heaven on earth. As long as we love we feel fine and does not need to be satisfied through our five senses. The best of love, I believe is that it creates beauty by those who loves. People who loves are more attractive then people who does not love. Love makes one sing when you talk, and have an easy way of living and is satisfied with love from within. The fact that only love makes heaven on earth a reality should attract the religous minded, so he can question the preist talk: "That Jesus Christ is the only way to heaven". Eckhart Tolle says that: "Pleasure is always derived from something outside you, whereas joy arises from within." and: "Love, joy and peace are deep states of Being or rather three aspects of the state of inner connectedness with Being." I agree with much of the teaching of Eckhart Tolle, but not always. For me the mind is a wonderful tool, because it can be connected to the inner love, happiness and peace of mind. Or it can be connected to the five senses and experience pleasure from them. After the first excitement had abated somewhat, we were seated and he began, "As the body represents the lowest degree of thought activities, so the Spirit represents the highest thoughts of Divine Mind. As the body is the outer expression of the thought, so the Spirit is that in which the form takes its initial impulse direct from the Divine Mind. It is the immortal and real Self, in which reside all the potentialities of Divine Mind. "The thought atmosphere is a real, substantial thing and has in it all that makes the body. So many people consider the things that they cannot see as unsubstantial; and although they are told, over and over that they cannot conceal themselves, they go right on believing that they can. Did Adam and Eve conceal themselves when they were hiding from the Lord, or Law of God? It is well for us to know the truth that we carry around with us the open book of our lives, out of which all men read whether we realize it or not. Some people are good thought readers, while others are dull; but all can read a little and we cannot conceal ourselves. Also, our thought atmosphere is constantly precipitating its slowly cooling words on our body and there it is seen by all men. We can, with a little practice, feel the thought force of this atmosphere that surrounds us and gradually gain a realization of its existence as real as that of the outer world. -Life and Teaching of the Masters of the Far East volume 2, page 67-68. The next morning Chander Sen continued his talk. "I have been shown beyond a question of doubt that the human intelligence can be transmuted into Divine Intelligence. As this was made plain to me, I found that I could enter the Kingdom of God and that Kingdom was right within. Now I know that God is the only power, Omnipresent and Omniscient; and that sin, discord, sickness, old age, and death belong only to a past experience. I now perceive the reality and know that I had been lost in the mist of illusion. Time and space have completely disappeared and I know that I now dwell in the subjective and that it belongs to the objective world. Had it been possible for me to have held to the promptings and the glimpses the finer senses have revealed from time to time, how many weary and anxious hours would I have been saved. While in youth I, like the greater portion of humanity, decided that there was but one life to live and that was the gratification of self in every way, so I determined to get the most out of that life. I made self-seeking the principal aim in life and I gave the animal passions full sway, with the result that I dissipated the life fluids of my body until it was but the empty shell that you first saw. Let me bring forth a picture that will more graphically illustrate my thoughts." -Life and Teaching of the Masters of the Far East volume 2, page 73.